The sum of FCFA 1.5 million was Saturday, January 29, raised to enable the commencement of building a St Therese Formation House in Buea, for the training of young girls as Reverend Sisters. The money was realised during the Silver Jubilee Celebration of the Sisterhood of Stella Nzelle Ekukole at the St. Anthony Parish Church, Buea Town. This was the dream which Sr. Stella expressed to Christians who turned up at the Parish to celebrate with her. “We realised that our House is far in the bush and many young girls do not know it. We already have a plot and so if we have a house in Molyko, then we can start training young girls to become Reverend Sisters. God is calling so many, but there is nobody to direct them, and my spirit has that desire to see young girls join this noble vocation,” she told The Post. Sr. Stella said the ceremony marked 25years of her stewardship, sacrifice and devotion to God’s vineyard in the congregation of the Sisters of St Therese of the Child Jesus of Buea. Sr. Stella said it is a challenge for young girls to follow God. She said that God calls and if one answers His call, He gives one the strength to do His will. She called on young girls and boys to answer God’s call, because, as she put it, it is noble to do so. ‘It is not everyone who is called who answers, and it is not everybody who has the call,” she said. It was also disclosed at this occasion that a special St Therese prayer group would be established in all Catholic parishes in Cameroon. “St Therese died at the age of 24 and her heart’s desire was to go round the world and tell people how much God loves them. We are trying to emulate her example by going round the world with her spirituality of joyful simplicity, love and confidence in God’ she said. The first prayer group, according to her, would be established in Doula. The Bishop of Buea, Immanuel Balanjo Bushu, who celebrated mass at the occasion, told the people that the name ‘Stella’ means a star and so Sr. Stella was like a star of St Therese. After Sr. Stella completed her training to become a State nurse in Shisong in 1990, she was posted to Baseng Health Centre and after two years she was sent back to Shisong to study midwifery. She served in Baseng as Matron of the Centre and main midwife for two years after her studies. 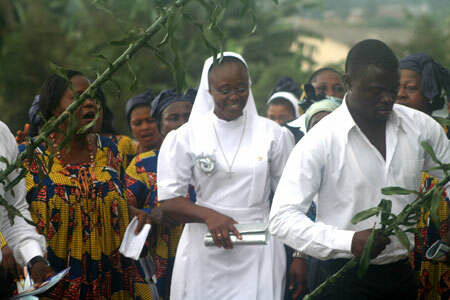 She was sent to Mt Mary Health Centre in Buea and became the Matron of the Centre in 1996. Between 1998 and 1999 she was transferred to Fiango Health Centre and later to Sabongari to begin a Health Centre for the Diocese of Kumbo. In February 2001, she left for a spiritual renewal programme in Ireland, and upon her return, she was again sent to Baseng to re-open the Health Centre there. She was later sent to Mamfe to start a new Maternity Centre and in 2004, was transferred to ARCH Mutengene to serve as Administrator in the Handicapped Centre. She would later come back to Mt Mary Health Centre where she is currently serving as Matron.